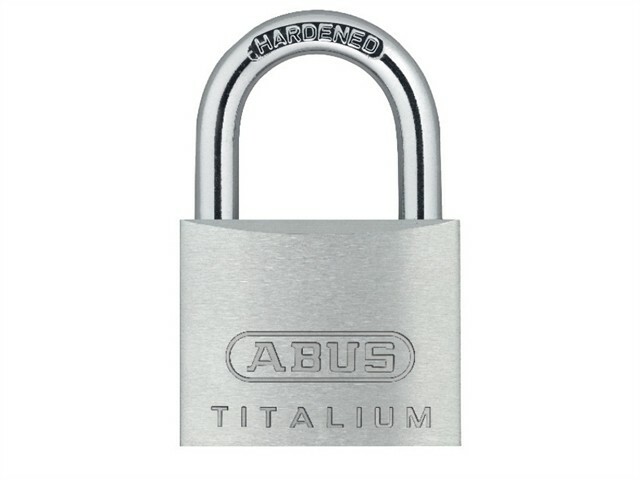 The ABUS 64TI Series TITALIUM™ Padlocks are ideal for medium to high risk of theft, recommended for a wide range of security requirements. All models in this series have a paracentric keyway and chrome plated cylinder cores. Hardened steel shackle, 30mm and above, with NANO PROTECT™ shackle coating which assures security and high corrosion resistance. TITALIUM™ is based on a special aluminium alloy, a mixture of materials is created that is extremely durable and lightweight; similar to the process used in aircraft construction. Compared to classic brass padlocks, the locks in the TITALIUM™ series are around 30% lighter but feature the same level of security making them excellent value for money. Sizes: 20 to 25mm, ideal for securing bags, suitcases, jewel cases, tool boxes, etc. Sizes 30mm and up, ideal for securing valuables/goods of medium value or at a an average risk of theft.